The strategy with the greatest impact on reducing greenhouse gas emissions is energy saving and efficiency. It is also the strategy that registers a better relationship between cost and efficiency. The EDIF Dept. has highly qualified engineers to carry out energy efficiency plans, energy audits and savings verification and measurement plans, both according to the International Performance Measurement & Verification Protocol (IPMVP) and the ASHRAE Guidelines 14-2002: Measurement of Energy and Demand Savings. 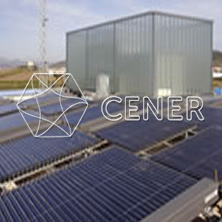 CENER offers the market its experience both in the execution of energy audits in buildings of the tertiary sector (offices, teaching centres, shopping centres, hospitals, etc. ), and in the execution of due diligence work in projects carried out by energy services companies. It provides the greatest technical rigour and independence when assessing the savings measures, both of which are fundamental when getting economic returns on investments made in the improvement of energy efficiency, reducing project uncertainties.